Horses and their humans love the Adelaide Hills, and horse enthusiasts will tell you the best way to discover the region is on horseback. Feel the clean country air on your face and enjoy the sounds and smells of nature – all at a pace slow enough to fully appreciate the pristine and diverse landscapes. 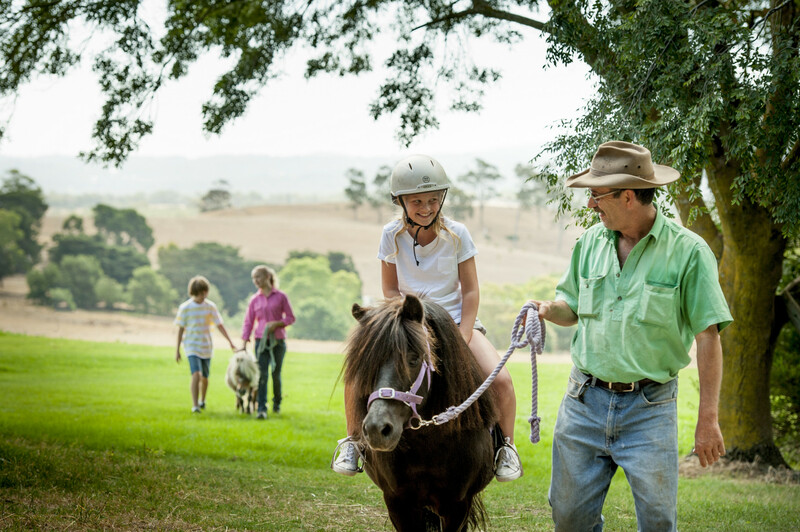 The Adelaide Hills has a very strong horse community and offers a variety of horse activities suitable for a range of ages and experiences, from riding schools of the highest calibre to pony rides and parties. Four Oaks Farm at Littlehampton specialises in lessons for children and adult beginner riders. Horse care and management is also taught, with trail rides and parties available. Four Oaks offers a complete farm experience with programs for pre-schoolers and ‘Ponies Love Parties’ program where party guests enjoy pony rides, pony carriage rides, hand-feeding animals and other rides on fire engines and ‘old-school’ merry-go-rounds. Four Oaks Farm has become the first accredited member of the Equine Assisted Growth and Learning Association (EAGALA) which is the leading international nonprofit association for professionals using equine therapy (horse therapy) to address mental health and human development needs. Templewood Horse Riding Centre at Inglewood in the northern Adelaide Hills specialises in lessons for beginners and nervous riders. Operations are led by Trish and Michael Kalleske who have run Templewood for more than 35 years and are accredited National Coaches. In addition to riding lessons they offer pleasure rides, saddle club and a program for tiny tots. Megan Jones Riding School at Kirby Park Stud in Hahdorf specialises in competition coaching through to children and beginners with riding instructors led by South Australian Olympic Silver Medallist, Megan Jones. There are also school holiday programs and weekend saddle club, trail rides, birthday parties, corporate team building and horsemanship programs for children. Academy of Dressage at Mount George near Bridgewater specialises in classical and modern dressage with International Riding Masters Barrie and Sarita Stratton. Barrie is an ‘A’ Level (Olympic) dressage judge. Also on offer are trick horse training and working equitation, which involves a range of activities including dressage movements and obstacle tests. Step back in time and travel in style in a horse-drawn carriage - Classic Carriage Drives, located in Montacute, regularly offers rides through the picturesque Adelaide Hills and is also available for off-site hire. For pony and other farm activities targeted at children see Family Fun. Trail rides through their large and picturesque properties are offered by Megan Jones Riding School in Hahndorf, Templewood Horse Riding Centre in Millbrook and Four Oaks Farm in Littlehampton. The 17 kilometre Amy Gillett Bikeway is designed for cyclists, walkers and horse riders. The bitumen track follows an old railway corridor running from Oakbank to Mount Torrens. Named in honour of champion Australian cyclist Amy Gillett the track is mostly flat, with four loop trails taking in other points of interest. Belair National Park features a series of shared use trails that are used by walkers, cyclists and horse riders including the Tom Roberts Trail. The Adelaide Trail Horse Riders Club regularly run trail riding events in the Adelaide Hills including 'come and try' events. The Easter Racing Carnival at Oakbank Racing Club is the world's largest picnic racing carnival, attracting more than 60,000 people across the two days of racing on Easter Saturday and Easter Monday. As a picnic race meeting, racegoers are able to bring their own food and drinks onto the course (at no cost) and enjoy a picnic by their car at various locations around the course. Alternatively, racegoers may choose to enjoy the numerous facilities that are available throughout the course. The Community of Macclesfield in the southern Adelaide Hills holds the Macclesfield Picnic and Horse Show on the first Sunday of January. Competitors come from far and wide to participate in multiple disciplines of equestrian. The event which has been running for well over a hundred years features Hacks, Harness, Novelties, Show Jumping, Hunters and Hurdles, Kids Corral, and Local Rider Events. The Horses in Action event is held in conjunction with the annual Mount Barker District Royal Show each March and features Hacks and Galloways, Andalusians, Side Saddle, Encouragement, Open Led, and Novelties. Country shows are always a great way to get a taste of country life and you can find a list of them here. Other events are run by Equestrian South Australia, Adelaide Polo Club in Mount Barker and Adelaide Polocrosse Club in Lobethal. The Adelaide Polo Club is located in the Adelaide Hills and is one of Australia's leading and most competitive polo clubs. Established in 1879, the club was originally located in the centre of Adelaide at the Old Victoria Park racecourse but is now based at Mount Barker among rolling hills and big gums. Horse SA is a good source of information and the Adelaide Hills Equine Network on Facebook also has lots of information.